Biofilms were actually observed long ago, before anyone had a clue what they were or how important they were. Indeed, at the time, no one really new what science was, let alone biofilms. Scientists, who were generally just inquisitive people who had other day jobs (or, more likely, were inquisitive persons of independent means) had few tools (e.g., microscopes) for studying things that were, well, microscopic. But science and scientists had to start somewhere. 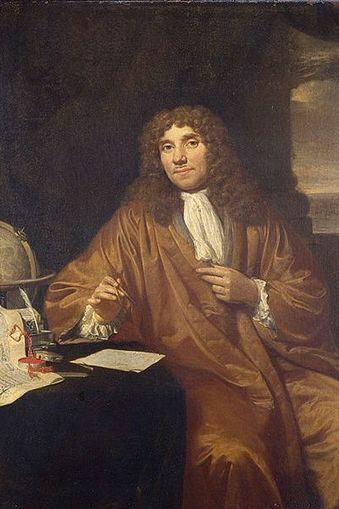 One of the early scientists to study microscopic life was the Dutchman, Antonie van Leewenhoek. He was well known for his ability to build microscopes that were quite a bit better than the run of the mill, the construction of which he held as a closely guarded secret. After utilizing one of his own microscopes in 1684 he remarked in a report to the Royal Society of London on the vast accumulation of microorganisms he was able to see in dental plaque : "The number of these animalcules in the scurf of a man's teeth are so many that I believe they exceed the number of men in a kingdom." (He was low...way low). In some ways it's too bad that this early work did not receive more recognition. For one thing, you just have to love that word scurf used by van Leewenhoek. It is so much more colorful than biofilm. And animalcules? Much cuter than microbes. You can find out a lot more about van Leewenhoek through a Web search. Among the interesting links are these: 1, 2, 3, 4. As with many things on the Web, there accounts differ depending on the source. Even his first name is spelled differently in different sources, but then, he probably spelled his name differently at times as well. Spelling was not a fine art at the time. 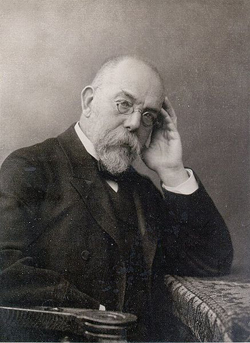 Since the pioneering investigations of Robert Koch (1843 - 1910) microbiologists have been investigating bacteria almost exclusively in single species planktonic culture. This pure culture paradigm became so ingrained in universities and medical schools that the idea arose that, "if you were not doing pure culture microbiology, you weren't doing science”. The pure culture approach was, enormously successful, affirming the wisdom of Koch and his contemporaries and leading to a "Golden Age" of microbiology in which the agents of many devastating human pathogens, including tuberculosis, cholera and diphtheria, were identified and largely conquered. Unfortunately this concentration on planktonic pure cultures led microbiologists away from the study of bacteria as they exist in nature. It was not until the early 20th century that some microbiologists began to feel that this view of bacteria was inadequate to describe bacterial life styles not to mention microbial interactions. Arthur Henrici wrote, for example, "It is quite evident that for the most part the water bacteria are not free floating organisms, but grow on submerged surfaces; they are of the benthos rather than the plancton." (Henrici 1933). And in a 1940 issue of the Journal of Bacteriology, authors H. Heukelekian and A. Heller wrote, "Surfaces enable bacteria to develop in substrates otherwise too dilute for growth. Development takes place either as bacterial slime or colonial growth attached to surfaces." In other words, when bacteria of all sorts can congregate in a colony as they attach to some surface, they begin to exhibit different properties than they do as individuals floating in isolation in some solution (e.g., water). A decade later Claude ZoBell reported on his glass bottle experiments in which bacteria introduced into a bottle disappear from the liquid phase. Simultaneously there was a rapid increase in the number of bacteria attached to the surface of the bottles. This bacterial adhesion was accompanied by a decrease in the amount of suspended organic material. ZoBell concluded that the bacteria attached themselves to the glass surface where they encountered a concentration of organic nutrients much higher than would have been found in the bulk fluid (ZoBell 1943). In the ensuing decades, microbiologists described many examples of microbe/eucaryote interactions of an astonishing variety. Some were mutualistic (Legume/Rhizobium nitrogen fixing associations, ruminant/microbe associations, Vibrio fischeri in the light organs of bioluminescent squid and fish) and others were pathogenic (Pseudomonas in the lungs of cystic fibrosis patients, Staphylococcus species in sinusitis and otitis media). One thing most had in common was that the microbial component of the association was found to be in direct physical contact with the tissues of the host plant or animal. These and other discoveries caused many microbiologists to grow uneasy about the idea that many or most bacteria live in the planktonic life style. Today we have ample justification for their concern. Investigations of natural habitats (Geesey et al. 1977) and human influenced ones verify that most of the resident bacteria, often in excess of 99%, are attached to surfaces and the ratio of sessile to planktonic bacteria is often greater than 1000-10,000:1. In the awakening era of biofilm investigation, (1970s and 80s), it was thought that bacteria growing on surfaces formed flat, uniform, and dull layers of cells covered and surrounded by slime. If our view was flat and boring, it wasn’t necessary to think much beyond a big colony growing on an agar plate. But the earliest confocal microscopic images revealing towers, mushrooms and evidence of channels deep within the biofilm mass radically changed our perspective. In this view, cells do not simply pile one on top of the other but rather they form structures of astonishing complexity. This complex architecture demands regulation and control and an entirely new way of looking at biofilm growth and development. In the late decades of the 20th century the study of biofilms began in earnest as a serious scientific endeavor. By this time scientists and engineers possessed adequate technology to effectively study microbial communities and to begin to understand the significance of biofilms. As is true of any new field of inquiry, though, it has taken time for emerging results about biofilms to catch on amongst researchers and educators at large. One notable effort was the establishment in 1990 by the National Science Foundation of an Engineering Research Center under the direction of biofilm research pioneer William Charaklis dedicated to the study of biofilms at Montana State University in the United States. Originally funded by a ten million dollar grant from the National Science Foundation, the center is now thrives as the Center for Biofilm Engineering and is supported through individual grants obtained by Center scientists and by a number of industrial affiliates who have interest in keeping abreast of the latest advancements in biofilm researcg. Other similar research groups now exists in England, Germany, and other countries. The fact that recognition of the importance of the biofilm phenomenon is so recent continues to have ramifications on education, health, and industry. Biofilm topics are still rarely covered in key university curricula, such as microbiology, biology, environmental science, health, medicine, and dentistry. Industries involved in developing products for the treatment of bacteria have only gradually been realizing that their products—which traditionally have been tested only on bacteria in isolation—may not work well on the same bacteria found as part of a biofilm in real-life environments. And health professionals are often still unprepared to deal with effects of detrimental biofilms in their settings. This is all changing, and you are becoming agents of this important change as you learn about biofilms. Figure 2. 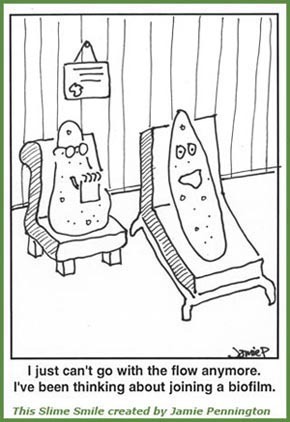 A Slime Smile Cartoon. The study of biofilms has grown markedly in recent years due to increased awareness of the pervasiveness and impact of biofilms on natural and industrial systems, as well as human health. Biofilms cost the U.S. literally billions of dollars every year in energy losses, equipment damage, product contamination and medical infections. But biofilms also offer huge potential for cleaning up hazardous waste sites, filtering municipal and industrial water and wastewater, and forming biobarriers to protect soil and groundwater from contamination. The complexity of biofilm activity and behavior requires research contributions from many disciplines such as biochemistry, engineering, mathematics and microbiology. New insights into the mysteries of biofilm are being published regularly in a wide variety of science and engineering journals. As we said, if you find this interesting, there will be a place for you in this exciting and rapidly growing field. Read on.